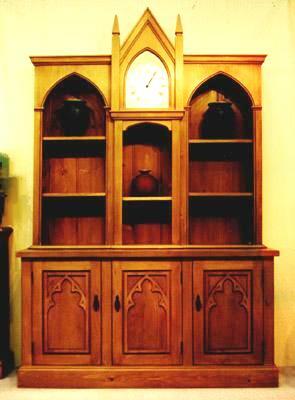 If you want to make a huge impact architecturally in your kitchen then look no further than this Gothic dresser. 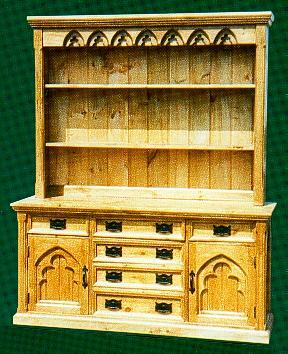 All the design elements, from arcades with tongue and groove panelling, stopped chamfers and iron handles, all give a good solid Gothic look. Practical as well as good looking, with plenty of drawer and shelf space. Shown against 2 backgrounds from different angles. Available in two sizes. 5' wide ( as shown ). Ref D007. Another stunning Gothic piece, more in the High Victorian style. 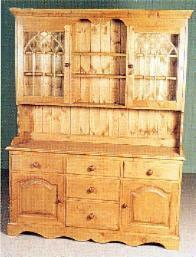 It is available as either a full dresser / display cabinet, or as a sideboard only. There is a clock in the central arch of the top. Width 5 foot. Finished in a pine stain / wax ( not as dark as this photo shows ). Made to order. Another way to treat a dresser visually by painting it. It has a very different feel to the wood dressers. 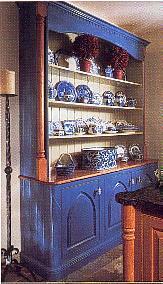 The dresser combines the painted finish with wooden columns & worktop. The styling was very simple, with just lancet shaped door panels. The shape could be further enhanced with Gothic shapes, as shown on the right. 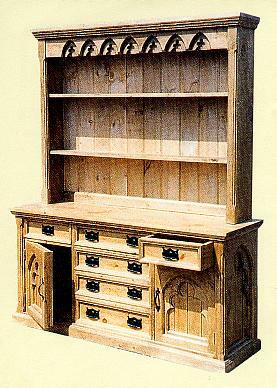 The dresser could be painted even more decoratively, see the decorative Gothic furniture section for ideas.